Riteish Deshmukh, who was busy shooting Bangistan in Poland and Ladakh, is now into his next comedy, Bank Chor. The latter also stars Vivek Oberoi and Rhea Chakraborty. Chakraborty was last seen in Mere Dad Ki Maruti but whose next release is Sonali Cable. She is also in Babbu Ki Jawani. Directed by Bumpy, Bank Chor is a comic-caper about three a�?moronsa�� whose attempts at a bank robbery go terribly wrong and how they are caught in the crossfire of cops, industrialists and corrupt politicians. While this is keeping Deshmukh busy on one hand, on the other hea��s trying to spend quality time with his wife Genelia, who is expecting their first child around the end of the year. The supportive husband was spotted keeping her company on her evening stroll. Following close behind were two a�?mindersa�� and their pet Cocker Spaniel. Now isna��t that sweet. This weeka��s release, Bang Bang, headlining Hrithik A�Roshan and Katrina Kaif, is an official remake of the tepid Hollywood action-romance Knight and Day starring Tom Cruise and Cameron Diaz. Roshan said of the remake, before its release yesterday, a�?People have seen Knight and Day and now they can see our film. There is a big gap between what we started with and what we have made. You cannot compare the two.a�? 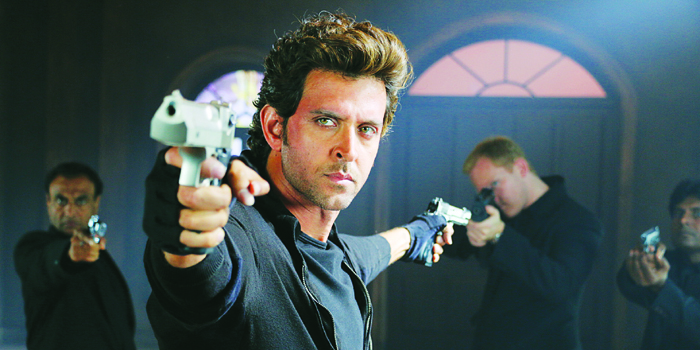 Roshan has done many of the specially-designed action scenes himself. Ask him if he feels a coming down after the rush of doing an adrenaline-pumping scene and he says, a�?Not really. You cannot hold on to any glory. You have to acknowledge the victory and look ahead to see what you can do to make your day even better. Every single moment life can be an adventurea��you can be in your house and think what can I do to stimulate my mind?a�? On such day, sitting in his Mumbai home, Roshan decided to open up a magic box and teach himself a few tricks. Maybe he can incorporate some of these into a film role one day. Vishal Bhardwaja��s interpretation of Shakespearea��s Hamlet, Haider starring Shahid Kapoor, Shradha Kapoor, Irrfan Khan, Tabu and Kay Kay Menon also released on the a�?most peaceful day of the yeara�� a�� yesterday. Set against the backdrop of Kashmir politics, Haider gives Tabu her second Shakespearean heroine after Maqbool/Macbeth. The actress said she went with her instinct when it came to doing the role. a�?Vishal narrated two scenes to me and I made up my mind to do it.a�? Looking back on her two-decade-long career, Tabu says she has a�?no regretsa�? about any of her choices. a�?We always do what we need to do at that point in time, to be who we want to be and to match our aspirations and needsa��and I went exactly with that. Some people really think ahead but I think I have been true to myself and my feelings and done what I thought was correct,a�? she says. And what about the things she feels are bad for her? a�?I will run away from thosea��including film offers,a�? says Tabu. Another actress who knows how to balance her work schedule and me-time is Kangana Ranaut. Having completed her screenwriting course in New York City, she is now busy with workshops for Katti Batti in which she stars opposite Imran Khan. But shea��s already hoping to take some time off to learn skiing and to devote to her various brand attachments such as A Small World. Kangana is the first Indian actor to be associated with this exclusive, private international club aimed at a global elite. The club offers its members benefits at more than 500 travel, fashion, and lifestyle brands around the world. Now thata��s called flying high.